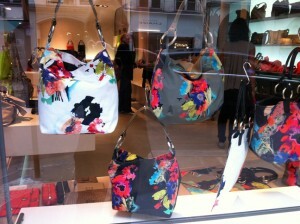 Just back from France—here’s the scoop! The scene on the streets of Paris is a return of the ‘70’s— off the shoulder dresses, low waist blouses, soft flowing skirts and peasant blouses in white or calico prints. Platform shoes, strappy high heels and short shorts—remember ‘hot pants’? 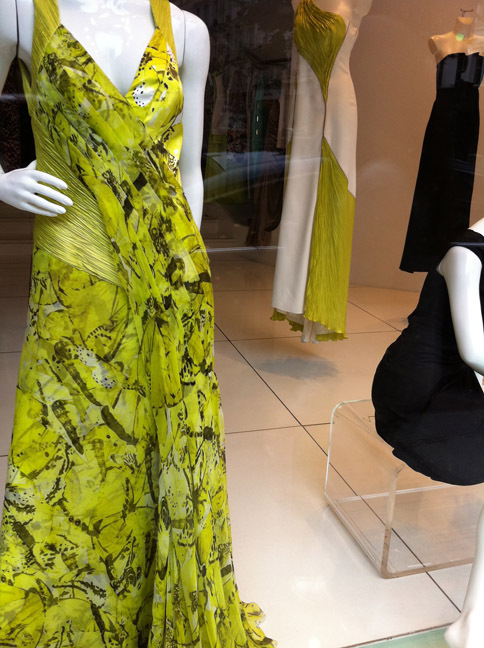 The colors are coral, neon yellow, vibrant pink and lime green—think psychedelic. Tan and beige or black and white are basics. 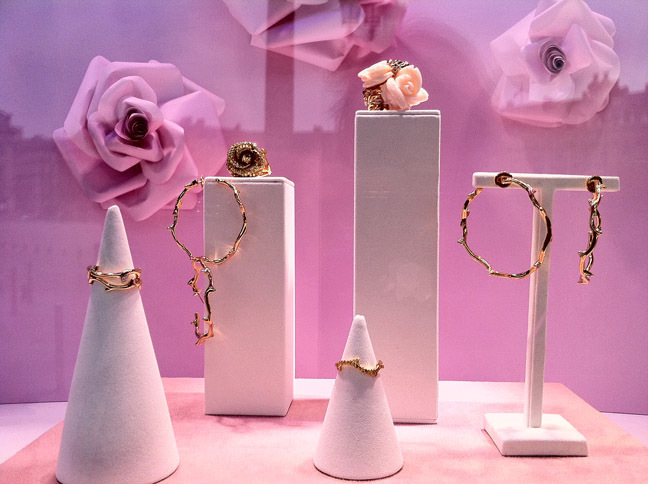 Dangling colorful gemstone earrings, hoops and rings in yellow gold with organic shapes and diamond headbands are displayed in the windows of the fine jewelers in Place Vendome. For daytime accessorize with long chains with large pendant drops and tassels, Jade, Native American turquoise jewelry, pearl earrings and engraved small charms. 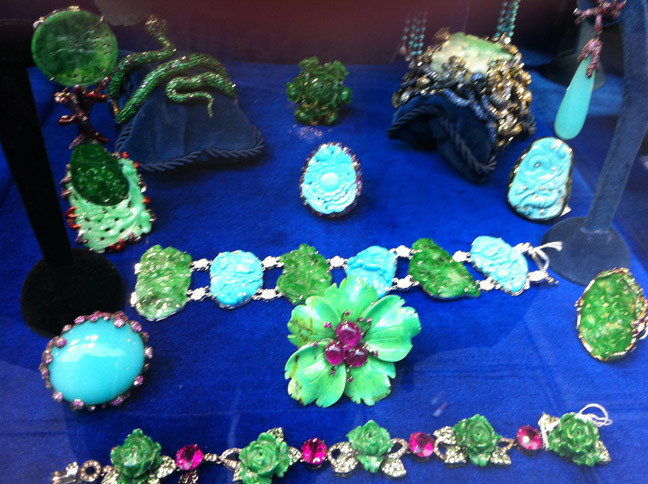 For antique collectable jewelry my favorite is still Lydia Courteille on rue St. Honore. 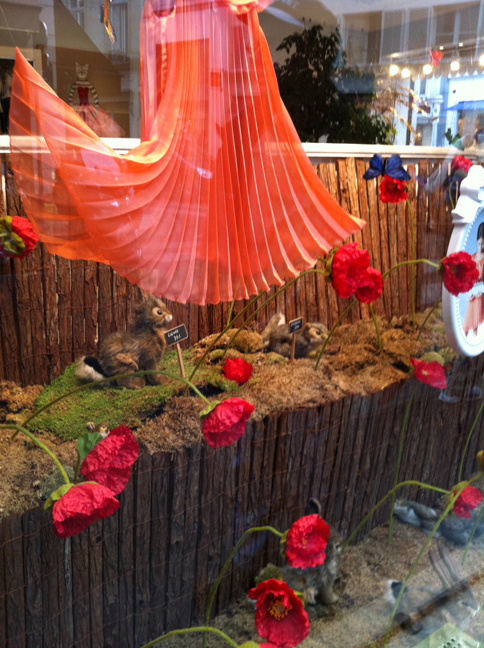 The window was filled with carved jade and large turquoise. 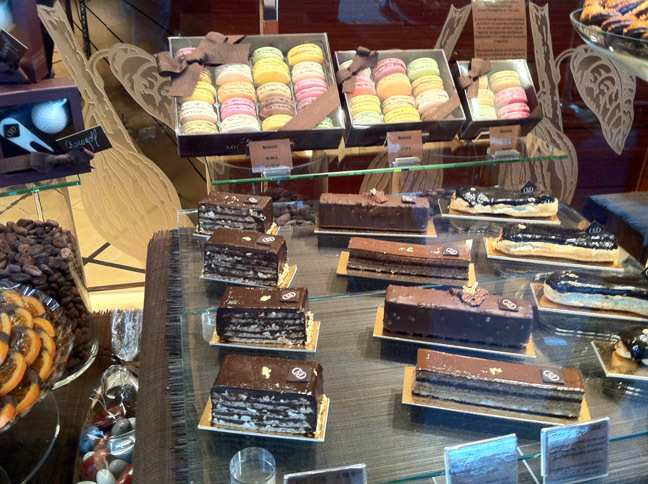 Handmade candies and pastries are a staple in Paris. This year macaroons are the rage, in many colorful flavors; the meringue melts in your mouth. Parisians make the best soft fresh nougats – with a hint of rose is just heavenly. 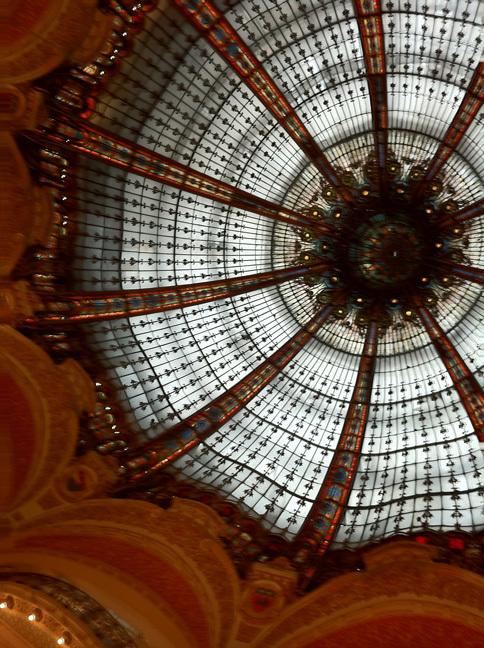 The Gallerie Lafayette, one of the first department stores in Paris, is more than just a place to shop. The huge store resembles an elegant opera house with a glass roof and each floor looks like rows of ‘boxed seats’ from below—totally elegant. 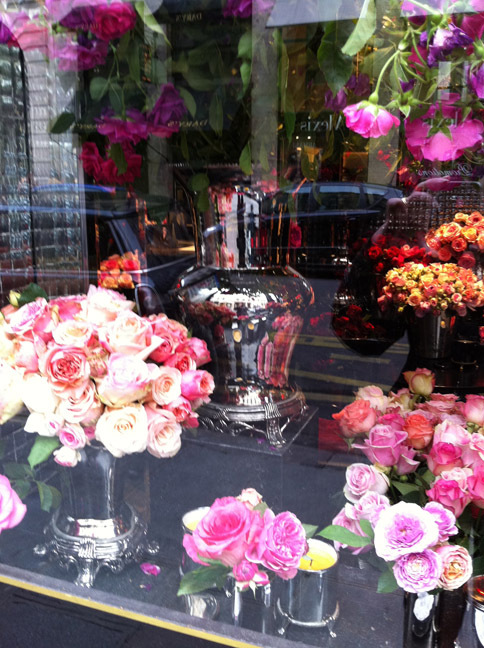 And in the heart of the city—you can always find roses. 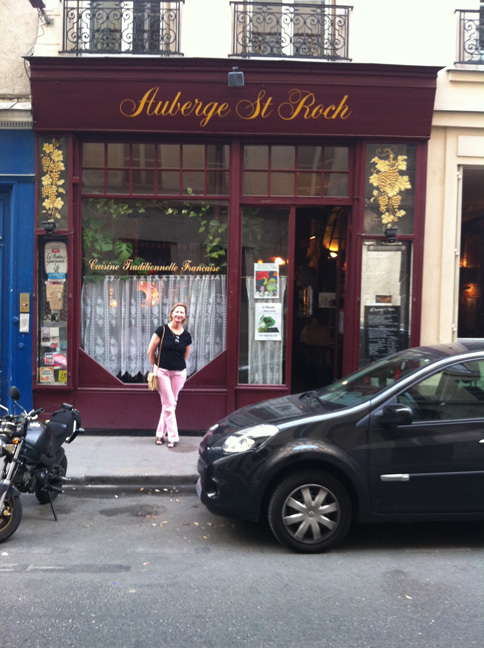 Me in front of a great family bistro, located in the right bank, that cooks fresh traditional food.